We had little experience of operating a boat let alone living in one but wanted the experience of a slow trek through the countryside. If you like the meditative wanderings through quiet historical French countryside with some social opportunities from time to time then this is the place for you if you are fit and healthy (see below). Provided you are not canalling there at peak times, the autumn days can be lovely, the water tranquil. You can be as solitary as you like or find some nice acquaintances for a chat on the way, waiting your turn at the lock gates or seeing familiar faces again at the evening moorings. It may be cooler though and you may need warmer clothing. Living on a boat is probably not for those who suffer from claustrophobia. It is tight with limited privacy when sharing with other people. You all have to respect each other’s spaces and its good to have a boat where everyone can find somewhere to chill out from time to time. We saw others with smaller boats and only two people manning them. This calls for prior knowledge or an experienced boat person. Our Sydney friends (a couple) did this successfully before us and one of them was an experienced boater. “It’s the locks that take time, not so much the kilometres. You have to be precise and slow in entering the lock and make sure you can stop precisely at the point where the person with the front rope can step onto the ladder and climb up. When that is done you have someone on shore who can tie the front of the boat securely to a bollard and then go back and take the rear rope and tie it to another bollard. Then you’re secure and you just wait until the gates are closed behind you and the sluice gates in front are opened so the water can flow in and raise your boat to the higher level. 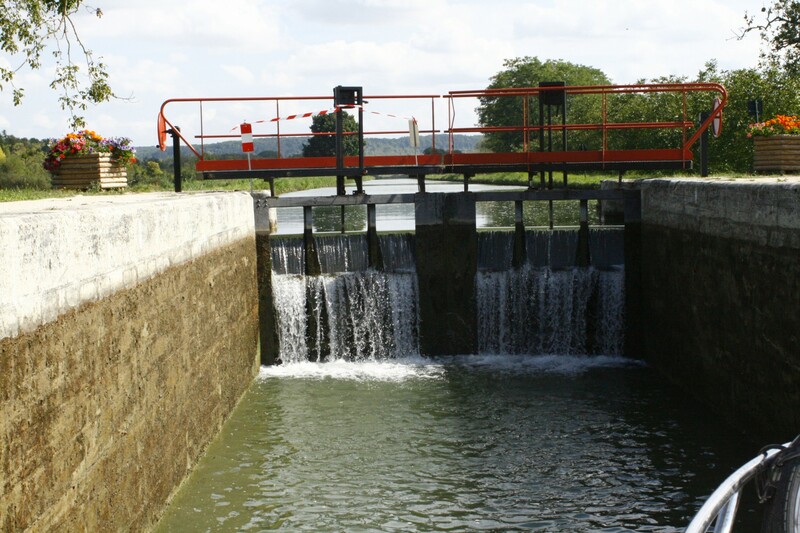 Only after the water level in the lock is the same as that in the canal in front of you can the lock keeper open the gates and let you go forward. We are travelling upriver, so we are always entering the lock at its low level and being raised to the higher level. The boat instruction at the beginning was brief and under the first bridge we got into trouble in a patch of weed and the boat lost headway and steering. The boat company were good to come to assess the boat within a half hour and all was well with a bit more throttle. Eventually we all opted for particular crew jobs we were comfortable with. Two of us were good at steering into the locks, one was nimble on the ladders in the locks and the other manned the ropes. The steering wheel had a lot of play in it and can be difficult for some to find the sweet spot and not oversteer. We are all in our 60s and fit. If you are not fit and coordinated, have knee or walking problems then its probably not for you or good to discuss your limitations with someone who owns a boat. In the past you could book – for a fee – a day’s sailing lesson (which includes steering) on Sydney harbour with WEA. This would give you a sense of steering and being in a confined space and climbing around ropes on a boat. On the way to Auxerre, Geoff and I moored the boat on a grassy slope and got on the bikes and cycled into the little village of Gurgy on a track beside the river to buy baguettes, cheeses and pastries for lunch. I had to pinch myself that I was deep in the French countryside on a pushbike looking for baguettes! Does life get much better? We didn’t see any evidence of housing developments near the canal or river, just villages and towns and rolling countryside with some historical walled houses and out buildings. 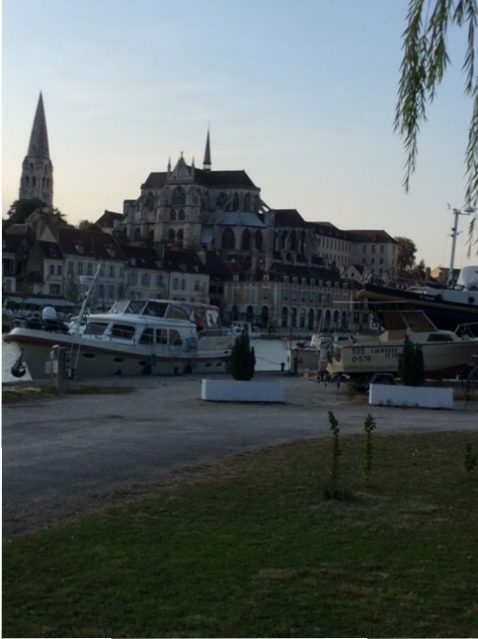 I cannot tell you how emotional I felt to wake on the river to the country cathedral bells peeling at 7 am in Auxerre. This whole trip can be a spiritual adventure and I would book at least 2 weeks to dawdle up the canal as part of the ‘slow movement’ to take the whole place in, history, culture, the people, the places. Even more time than 2 weeks with just the two of us in 2016. Look up the history of the area before you go and savoir the place and what has been before you. I had the best Duck Confit in a little café just back from the water at Auxerre, and I have not come close to its tenderness or flavour ever since. We spent a late night in one of the cathedrals listening to music which was very nice. The walk back to the boat in the dark through the old streets in the town and over the bridge was beautiful. Its the ordinary things that are so familiar but different and sacred on someone else’s shores. You will find good wifi connection in some towns and some waterside amenities offered a shower block at the marina as opposed to the small cubicle/ensuite on the boat. We had to plan for the 5 more nights on our boat and check our itinerary and plan how far we needed to travel each day. We found the number of locks were a big factor and passed about 7 or 8 locks in a day, aiming to complete the 40 all up in 7 days. 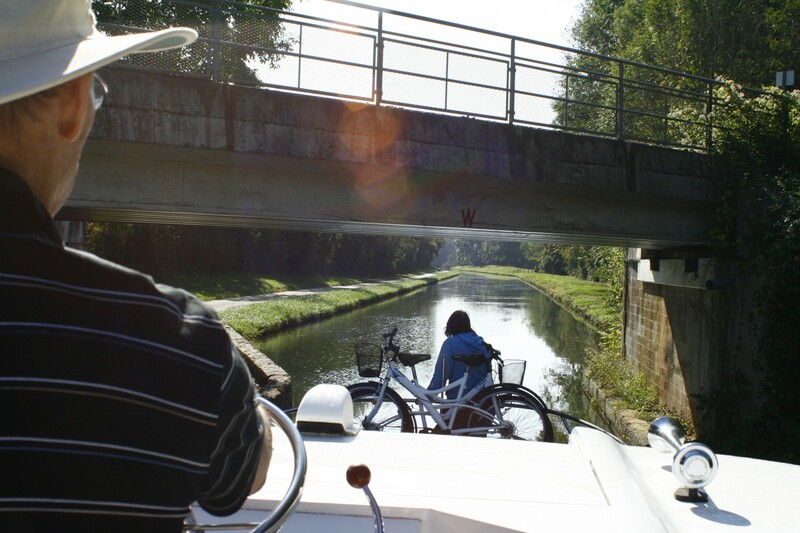 We didn’t have time to cycle for long off into the countryside or on the paths beside the boat as we had hoped. This impacted on a fast and targeted pace and being tired at the end of the day, when the cheeses and wine were relished. While our crew applied themselves to the serious business of steering and negotiating locks, I did manage a terrific free roaming chicken casserole, all ingredients bought from a little town supermarket near Vincennes and the chook farm seen from the canal (more than 2 sq mtr per chook!). The crew were hungry smelling it simmer on the stove. Those boats have the basics to cook a good meal. I cannot tell you how wonderful the self made casseroles taste in Europe. I managed to make a very tasty and wholesome chicken and vegie casserole in both Italy and France in the countryside from local ingredients and it tasted out of this world. Why don’t my Australian chicken casseroles taste the same?